Seriously, I like having an extra bit of cosmetic distinction available in game, and WG managed to implement it in a non-invasive way. Custom flags wouldn't have worked so well as you rarely have a chance to see the flags of opposing ships. This basically accomplishes the same thing, but lets you use them as a calling card when you sink someone. I'm sorry for folks that are offended by them, but I actually find myself liking the addition of the badges to the game. As a certain Scottish paladin once said, "Don't weep for the stupid, you'll be cryin' all day." I like the badge system too (though I am curious to see how the emblems themselves come into play), but they could do with a bit more variety. Given how they're rolling them out, however, makes me think that there will be more to come on that front in the future. I don't mind them one way or the other just wish they gave the option of turning it off. I don't like how it covers the lower portion of my map, could care less what little pretties people put on their ship, I want to see my map. As far as them popping up when you get killed, don't care. I feel about the badges/emblems like I feel about the vanity flags. They are meaningless and not particularly interesting. There should be an option to turn them off. I think they are silly. They serve no purpose. If the emblems brought some kind of bonus, even small. That is a purpose. 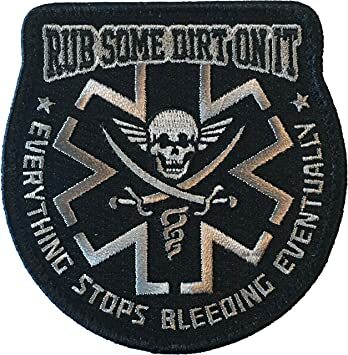 Badges/patches, no, whatever. Goofy addition that does nothing. Just my opinion. I think they're a cool idea. I'm interested in what comes in the future after this. I'd just like that instead of taking a 3rd of your screen for x seconds, i'd prefer if it would flash in the center for a split second instead, then like minimize and zoom by the name in the kill feed. So its still visible but also out of the way. But, what purpose do they serve? A large emblem of clip art graphics fills your screen upon sinking. And? The same purpose as in any other online game. The closest and most relevant analogy I can think of is EA's Battlefield series, which has literally hundreds of different dog tags that you can earn and use. They are a mark of distinction, and players like to have something distinctive. Fine, put the on the ship, not on the other player's screen. Play dress-up with your boat all you want to, not sure anyone would care. Just allow people who don't care for the content to opt out just like any other silly stuff they have put in the game. 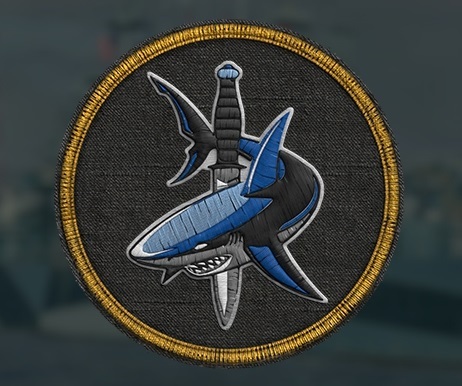 I'd like to see a way that clans could design and use their own patches. Having a clan-specific patch appear whenever someone is sunk by a member of a certain clan would soon make its name renown if its members were any good. Have you never played Battlefield? The dog tags of the person who got you are shown in the killcam, and indeed you can steal others' dog tags as a mark of humiliation, by sneaking up behind them and gutting them with a melee attack. Now granted, given what you and others are saying, I can see a case being made for at least reducing the size of the badges when they do show up. I can only assume that those who are complaining about the size are running at lower resolutions (less than 1080p), because from my point of view, they are fine. I also like that each player has their badge displayed where the ship compass icon would be, when watching the battle after they have been sunk; before, that was just an empty space. The above patch could represent my clan. Except this isn't EA Battlefield, and really has little in common with most combat games. The serious population in this game is tiny, I don't think I've ever played a combat game with this many casual players, but then most games aren't filled with us old folks either. You can keep ignoring that fact or not, really doesn't matter, but considering all the things that need work in the game, and the complete lack of any call for this type of stuff, people are going to complain. Personally I think wasting time on more eye candy when the game itself needs work makes little sense, but what do I know. I am however disgusted with what they've done to the training room, if they wanted to make it useless for testing, they succeeded. No never played BF. Having a game mechanic that is intended to be humiliating to another player doesn't seem sporting. I suppose the same kind of people who like that idea probably like to collect the ears of people they have killed in combat. I have never met anyone who was in combat that wanted a trophy of the person they killed. Something a bit psychotic about trophy collectors IMHO. The option to turn it off was a no brainer. Not sure what they were thinking, you can not add something to the game that 100% of players will like (usually). By "forcing" players to see this stuff it only engenders anger and contempt and neither is good for gameplay, sportsmanship, or business. It is a poorly implemented change to the game and needs addressing. As I have stated elsewhere, the art department has nothing to do with fixing the game. As much as I agree with you that WoWS is in dire need of a re-optimization, I cannot begrudge them letting the art department work on such a system and implementing it into the game, when otherwise the artists wouldn't be doing anything useful. No offense, but you sound eerily like the talking heads who bemoan video games in general in some bid to get the public to stop buying them because...reasons. Yeah, no. Again I am glad the patches are in the game for those who like that kind of stuff. The option to turn it off should be available for those who don't care for it. Pretty simple. I have never "bemoaned" anything nor given anyone but my friends advice on what games are worth playing. I could care less what someone else, especially strangers, do with their time or money. You directly compared in-game elements to real-world violence, and in doing so suggested that those who engage in such behavior are somehow mentally ill. That is flat-out disingenuous, not to mention scientifically baseless. That's the same kind of crap that Jack Thompson pulled, and he ended up disbarred and leaving public life in deep disgrace. I don't think people are offended by them as much as finding them annoying, crass, and silly. The overbearing, in-your-face presentation. The questionable aesthetics of the emblems. No option to turn it off. The game doesn't need pointless bling. Frankly, I would have thought this sort of thing would be beneath Wargaming. Horse feces. I said that anyone who wanted trophies of kills was psychotic. BTW I am no expert but I think that my statement probably has scientific backing.. I am no scientist but even I know that is sick. If you think otherwise then maybe you have some psychopathy going on..
BTW other than getting someone's gear, why would anyone want a virtual trophy of a virtual kill in a game? Kind of pathetic.. The equine excrement is on you, not me. In first-person shooters, people teabag the enemies they kill all the time, in any game where there is a crouch function. Battlefield went one step further by adding the dog tag mechanic. In your post, you directly compared these and other activities, "humiliating" the player, to the idea and act of taking trophies off dead bodies in actual war. And then you assert that anyone who does it is a psychopath. When I point this out, you then go one step further by alluding to me possibly being psychotic...which is a rather Quixotic thing to do on your part. On the other hand, there is a strong and direct correlation between the rise in the popularity of video games and the decline in violent crime. It is still unclear if the former is the cause of the latter, but it is definitely not true that any behavior in video games has ever caused someone to go out and do bad things. I like them, But I was disappointed when the badges do not show up on the hull of your ships. :/ Seems kinda pointless to me. LOL whatever. Anytime a game mechanic is introduced to purposely humiliate the other player is stupid IMHO and probably has a basis in some mental disorder. It is silly. BTW don't give a damn about what is done in other games. I can play or not play whatever I please and think others should be free to do the same. Never said video games were good nor bad, could care less. I have been a gamer in one fashion or another all my life and I have never been tempted to do anything violent because of a game (or tv for that matter). Not sure why you are attributing such crap to my posts. I will go back to my ORIGINAL assertion that the mechanic is fine for those players who want it but there should be an option to disable it for those who do not like it for WHATEVER reason.